Carnivorous perennial that forms funnel-shaped insect traps by adaptation of the leaf. 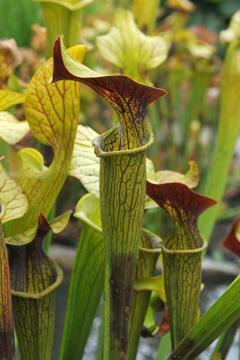 The "pitchers" vary from lime-green to yellow and may be strongly flushed and veined with red. Large yellow flowers in spring. Can be grow in containers under glass, using a peaty compost. Use rain-water if possible. From southeastern parts of the USA, found in boggy areas.